Third time lucky – hell yeah!! July 22, 2013 July 22, 2013 elskenewman9 Comments on Third time lucky – hell yeah!! It has been a bad week here in Newman Towers. Elisabeth was not well and on Saturday last week my husband and I got a stomach bug at exactly the same time. I won’t go into details, I’m sure you can imagine. But let us not dwell on the bad, there were good and funny things too and I would much rather share those. When Elisabeth was poorly I explained to her that she had a bit of diarrhea. She got outof the toilet and said: “Daddy, daddy I have dungarea!” That made me smile. Now the next bit is a little bit disgusting but it made me laugh so much that I think it should be mentioned. Yesterday after dinner Elisabeth was playing outside, she was wearing a pretty little dress and at some point during the day she had taken her pants off. Because if was so warm (hot really) and close to bath time we didn’t bother putting them back on. So she is happily playing outside whilst we tidy the kitchen. Next time I look there is this huge poo right in rhe middle of our decking! Like a proper grown up sized poo! Elisabeth didn’t seem to think much off it and wanted to continue playing, but we thought it better to clean it up first. I laughed so much, this was definately the funniest poo incident to date. But the real highlight came on Wednesday. We have had a couple of months full of worry because shortly after our second miscarriage we found out I was pregnant again. We were obviously delighted but too nervous and scared to be really happy. 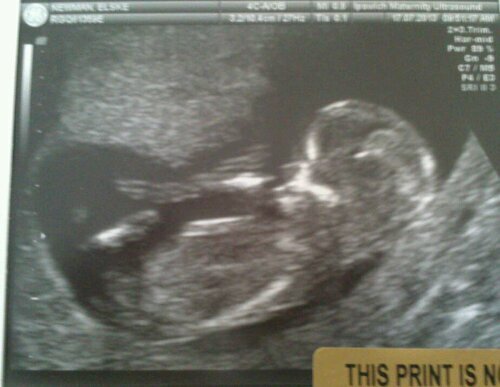 But on Wednesday we had our 12 week scan and bubba is growing fine! I have never been so relieved as when I saw and heard its little heartbeat. So, after the devestating end of the previous two pregnancies; Third time lucky – hell yeah!!!!! oh congratulations!!!! how exciting!!!! and that poo story was a hoot! Thanks Larry, we are very happy indeed and it was lovely to finally be able to share the news! I am sure it was. I am in Newman Towers in spirit today sending good vibes.